Fed up with being mortal, Ares calls upon Xena to helphim restore his godhood, unaware that the Furies are conspiring againsthim. Xena is forced to battle Mephistopheles (Anthony Ray Parker)when she returns to Amphipolis with Gabrielle and Eve to find her homehaunted by evil. Lucy mentioned I should ask Renee about the pureed asparagus,KY jelly and vegemite! Xena fights to avoid inheriting the throne of Mephistophelesby devising a plan to turn the cocky archangel Lucifer (Alex Mendoza) intothe King of Hell. 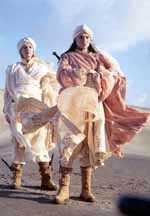 When Gabrielle learns that her niece has been capturedby the vicious raider Gurkhan (Calvin Tuteao), she sets sail for NorthAfrica on a rescue mission with Xena, Eve (Adrienne Wilkinson) and Virgil(William Gregory Lee). On their travels through the North African desert, Xenaand Gabrielle intervene to help two tribes of warring nomads unite againsttheir Roman enemies. This episode sure made for some beautiful photos. 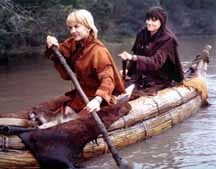 Xena and Gabrielle are forced into a deadly confrontationwith cannibals when they go in search of Virgil (William Gregory Lee). I've just seen "The Abyss." It contained, for me, themost heart-breaking scene. Gabrielle's been keeping something secret fromXena and the revelation was so painful, I just turned it off after thescene was over. I'll go back and watch the end of the show later. I rarely make posts about upcoming episodes, but whensomething affects me this much, I just want to let people know somethinggood is coming. I don't want to give more away cuz then you won't feelit the same way I did. Rob said I should brush up on my Beowulf and "The Ring"saga for the next three episodes. Actually, he said I could read the comicbook version of "The Ring." Xena embarks on a deadly mission involving her dark pastwhen the Norse warrior Beowulf (Renato Bartolomei) approaches her for help. Xena must battle a monster of her own making to recoverthe destructive Rheingold ring she forged in her days as an evil warior. Xena batles to regain her memory and reverse the curseof the Rheingold ring. For all those who have been asking, the middle photo isof Xena and Gabrielle. 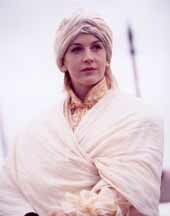 There are some stunning photos coming out of this episode.Xena in a long white dress walking in the surf. Between the costume designer,Geoff Short (the photographer) and Lucy, this stuff is awesome. To protext Ares from a gang of revenge-seeking warlords,Xena brings him to her childhood home and disguises him as a farmer. Lucylearned to milk a cow for this episode -- much to Renee's dismay (grin). And then there's the Jane Russell-Gabrielle photo shootin the barn bathed in a golden glow. Geoff Short at it again. 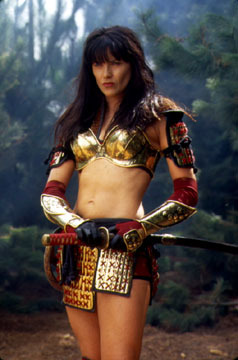 Xena becomes the ultimate prey for the deranged PrinceMorloch (Sandy Winton), who has been hunting and killing Amazons in histwisted quest for an adversay who can match his skills. Meanwhile, Xenateaches Varia the value of listening to the voice of experience. This is Renee's second appearance as a director. Her airtime in Return Of The Valkyrie was limited to give her time to work onthe pre-production of this episode. Time to rent Cornel Wilde in "The Naked Prey." Maybeyou should read Richard Connell's "The Most Dangerous Game." Or check outthe many movies made from that short story. The Archangel Michael (Charles Mesure) summons Xena tokill the now immortal Roman emperor Caligula (Alexis Arquette), who hasbeen murdering innocents in his quest for absolute power. In an ancient world meets modern-day satire, a tabloidTV reporter (Michael Hurst) stalks Xena and Gabrielle, determined to geta juicy scoop on the Warrior Princess. Xena and Gabrielle fight to save Eve (Adrienne Wilkinson)from execution when she returns to Amazon lands to make amends for herpast. This is where Eve is put on trial by the Amazons. When the Amazon Queen Varia (Tsianina Joelson) is kidnappedby a masked warrior, Gabrielle leads the Amazons to Helicon on a bloodyrescue mission. Xena tries to save Private Ryan. In a modern-day episode, a clone of Xena battles herarch-enemy, the evil Alti (Claire Stansfield). Modern-day Xena fans clone Xena and Gabrielle. This is a clip show. Renaissance, however, did raid our warehouse for thismodern-day story, which is definitely a comedy. This show also marks thereturn of Alison Wall and I think you could safely say she got some practicefor the part she plays in this episode when she was Minya in A Day In TheLife. Xena and Gabrielle must save a young centaur from theclutches of Lord Belach (Marton Csokas). We revisit Ephiny and her son, Xenan, along with Boriasand his son, Belach (both played by Marton Csokas). Xena becomes the Empress of Rome with no recollectionof her past when Caesar (Karl Urban) chains up the three Fates and cutsthe strands of time to alter his destiny. The return of Karl Urban as Julius Caesar and ClaireStansfield as Alti! Could Xena's life have taken a different turn? What if Xena and Caesar had become allies? On their way to deliver the Helmet of Hermes to Thebes,Xena and Gabrielle save the young virgin Genia (Katie Stuart) from beingsacrificed by religious zealots. Renee says this was kind of like A Day In The Life. A comedy with Alex Tydings as Aphrodite. There's a tip of the hat to the musical that never wasin this episode. When an ancient scroll chronicling the life of Xena surfacesin the present, conflicts arise among the modern-day reincarnations ofXena, Gabrielle, Ares and Joxer. 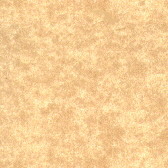 This deals with a lost scroll that solves the mysteryof how Gabrielle survived the lava pit in "Sacrifice II." Anothermodern-day story which also marks the return of Annie, Mattie and Harryfrom "Deja Vu All Over Again." Summoned by a long-lost spiritual soulmate, Xena headsfor Japan with Gabrielle on a daunting mission to save the city of Higuchifrom destruction and make amends for her past. Xena and Gabrielle face the greatest threat they've everknown when they go up against the evil Yodoshi and an army of 20,000 eliteSamurai warriors.